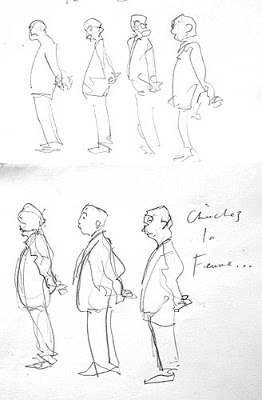 Drawing quickly moving figures involves a certain element of caricature. Because you only have a limited amount of time, you must select & hone-in on the essentials of the pose, which not only means portions etc. but the meaning of the pose. What the model is doing & what he is feeling. Here I somewhat maliciously caricaturised an elderly gentleman waiting for his wife. He was frowning & twiddling his hands trying to look inconspicious. Much relief when his wife arrived.